Comics maven John DiBello — who brought you an awesome primer on MIRACLEMAN — is back with the tale of a Marvel comic you probably never heard of. Any serious fan of Marvel Comics is justifiably proud of a huge amount of trivia, factoids, and minutiae. The fan — heck, let’s put that in capitals! — The Fan knows that cosmic menace Thanos premiered, of all places, in Iron Man #55, that the commie-smasher Captain America portrayed in 1950s Atlas-era comics was William Burnside, not Steve Rogers, and that the address of Avengers Mansion is 890 Fifth Avenue in Manhattan, a block occupied by the Frick Collection museum in our universe. There are Marvel Comics published since Fantastic Four #1, however, that most Marvel readers never heard of after they faded into the realm of little-seen, seldom-demanded back issues. Let’s pull back into the limelight one of these Marvels That Time Forgot, a phantasm who wasn’t a part of Power Pack, a wraith who wasn’t in World War Hulk, an apparition who never assembled with the Avengers: HOMER, THE HAPPY GHOST! Like much of the contemporary Marvel Universe, Homer flew onto the newsstands thanks to the 1968-’69 Marvel Explosion, which dramatically increased the number of titles Stan Lee’s House of Ideas published in the early 1970s. A quick history lesson: Before 1957, Marvel’s predecessors (Timely and then Atlas Comics) were distributed to newsstands by the American News Company, the largest distributor of books, magazines, and comics in the 1940s and ‘50s. The U.S. Justice Department brought and won a suit of “restraint of trade” (attempt to create a monopoly) against American News. In 1957 American swiftly went out of business, forcing Atlas publisher Martin Goodwin to switch to rival distributor Independent News, owned by National Periodical Publications — the parent company of DC Comics. Independent restricted Goodman to release no more than eight comics each month. You’ll find the “Ind.” logo on the covers of 1960s Marvels distributed by Independent. In 1968, Goodman sold Marvel Comics and his other publishing holdings to Perfect Film & Chemical Corporation. An unusual name for a publisher, yes, but Perfect Film is listed as the publisher of Marvel in indicia of late ‘68/early ’69 comics. A year later in 1969, Perfect bought magazine distributor Curtis Circulation, and in September of that year, the Curtis Circulation “CC” logo began to appear on Marvel’s covers. Freed of its DC-owned distributor, Marvel Comics now had the freedom to dramatically increase its line. This Marvel Explosion brought the world brand-new titles like Conan the Barbarian, but initially the bulk of added comics were reprint titles utilizing the vast inventory of stories from the 1950s Atlas era: books like Fear, Where Monsters Dwell, and The Mighty Marvel Western. 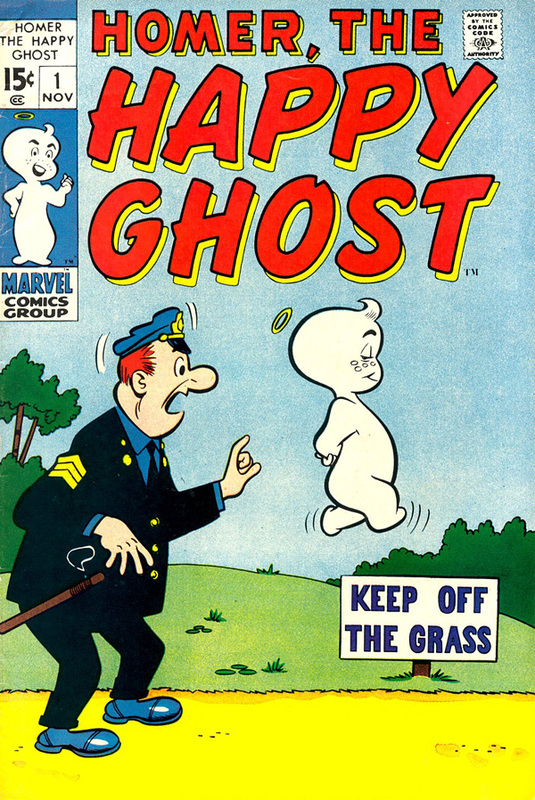 Little remembered today, however, is the small line of early ’70s kid-targeted humor reprint comics: titles in the not-so-Marvel tradition like Homer, the Happy Ghost, whose first Marvel Age comic book was released in late 1969. Panel from Homer, The Happy Ghost #1 (November 1969), script by Stan Lee, art by Dan DeCarlo. Homer didn’t originate in the groovy Sixties or swinging Seventies. He was a ghost child of the 1950s, originally appearing in his own Atlas comic that ran 22 issues from 1955 through 1958. Although sales figures are unknown, it must have been one of Atlas’ better sellers: In 1957, it was one of the 16 Atlas comics out of more than 80 that Goodman decided would survive under Independent’s distribution restrictions. Along with Millie the Model, Homer was actually one of the few Atlas characters who had more than one comics series, if for a short time only: Adventures of Homer Ghost ran for two issues in 1957 before getting the ax under the new distribution arrangement. Starring in a pair of series practically makes Homer a Wolverine of his time. His reprint revival in 1969 didn’t last nearly as long: four issues through 1970. Atlas-era Homer. 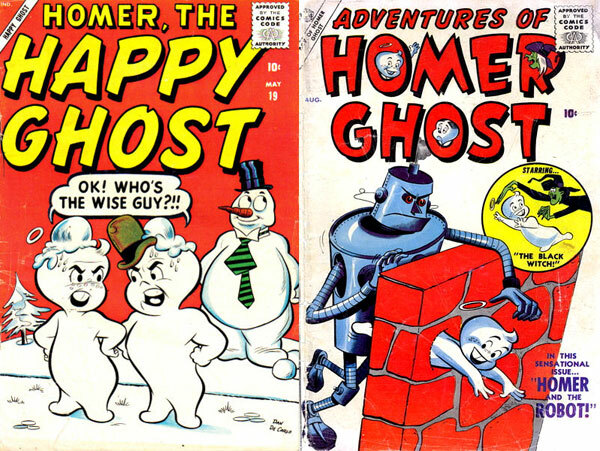 Left: Homer, the Happy Ghost #19 (May 1958), art by Dan DeCarlo. 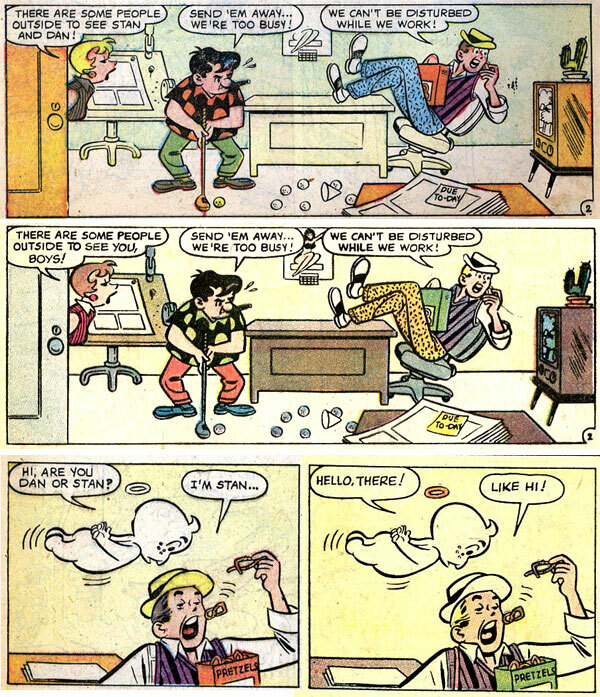 Right: Adventures of Homer Ghost #2 (August 1957), art by Tony DiPreta. If Homer looks familiar, that’s no coincidence: He was created and designed to capitalize on the tremendous success of storybook, movie cartoon, and Harvey Comics’ Casper the Friendly Ghost. Take away Homer’s trademark freckles and halo and even the Ghostly Trio would be hard put to pick Homer out of a ghost-police lineup of Casper impersonators. 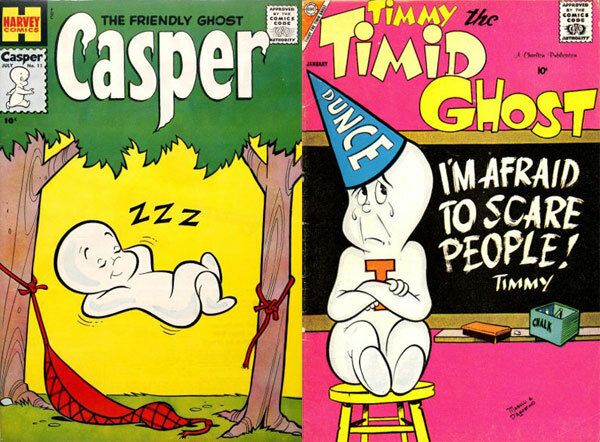 Homer wasn’t Casper’s only copycat: Charlton Comics debuted “Timmy, the Timid Ghost” in 1956. Casper is the one we remember, however, not the copies: Through his decades-long career of cartoons, movies, and sheer overwhelming number of different Harvey comic book titles, Casper’s become an icon of the ages while Homer and Timmy have, typically enough for ghosts, just faded away. 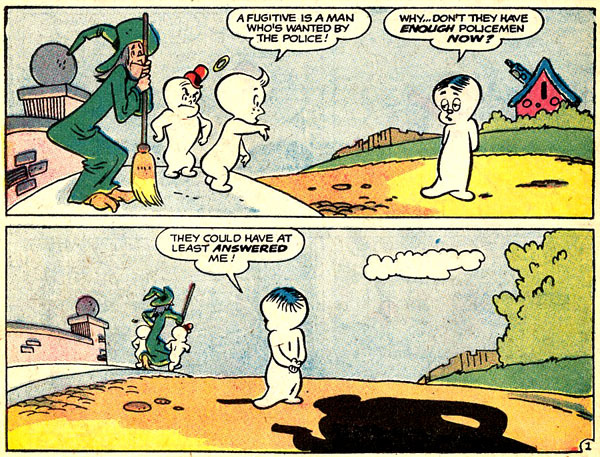 Left: The Friendly Ghost, Casper #11 (July 1959), art by Warren Kremer. 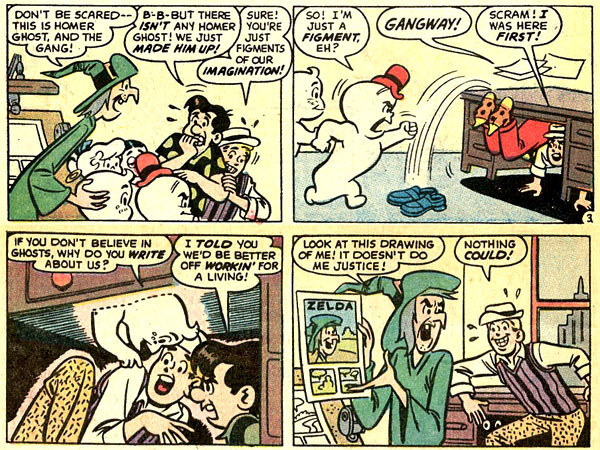 Right: Timmy the Timid Ghost #13 (January 1959), art by Pat Masulli and Jon D’Agostino. Homer has a definite charm, however, due to the partnership of Stan Lee on clever, funny scripts and long-time Archie Comics artist Dan DeCarlo. Homer was less innocent and more mischievous than Casper; his adventures and friends often resembled the little-tough-guy escapades of Dennis the Menace (another character eagerly copied by rival comic companies, including Atlas). Lee and DeCarlo populated Homer’s world with a cast of copyright-testing characters like Gobby the Greedy Goblin, Zelda the Scatter-Brained Witch, and Snappy the Ghost Dog. Homer’s roughneck best pal is a virtual carbon copy, complete with hat, of Harvey’s “Spooky, the Tuff Little Ghost.” He’s called “Dugan,” a name Lee would use again when he created another derby-hatted tough guy in the pages of the Sgt. Fury comic: “Dum-Dum” Dugan. Although the humor sometimes substitutes clichés for punch lines (“dumb” character Morton the Mixed-Up Ghost can never do anything the right way), there’s a good deal of wit and jokes that can still elicit giggles in the 21st century. The ghost of “Dum-Dum” Dugan? Panels from Homer, The Happy Ghost #1 (November 1969), script by Stan Lee, art by Dan DeCarlo. Although he’s best known for his work at Archie Comics, the importance of DeCarlo to what later became Marvel Comics is substantial. He got his start at Timely in 1947 penciling the comedy comics Jeanie and My Friend Irma, which became a stylistic groundwork for one of Marvel’s oldest original characters, Millie the Model, whose adventures DeCarlo drew for a decade. He’s also the co-creator, with Stan Lee, of a comic strip following the adventures of a hapless postman: Willie Lumpkin, whose name Lee eventually re-used as the mailman for the Fantastic Four. On Homer, DeCarlo’s energetic cartoon art brings to life a world where burglars, movie directors, and shop clerks interact with cute ghosts and ghoulies. Even in the simplified shorthand of the physical body language on a witch or ghost, DeCarlo shines: An arched eyebrow, shrugged shoulders, or drooping eyelids tells a story about the characters. Panels from Homer, The Happy Ghost #1 (November 1969), script by Stan Lee, art by Dan DeCarlo. Man, dig that striped vest, mohair trousers, and jaunty hat, Stan! 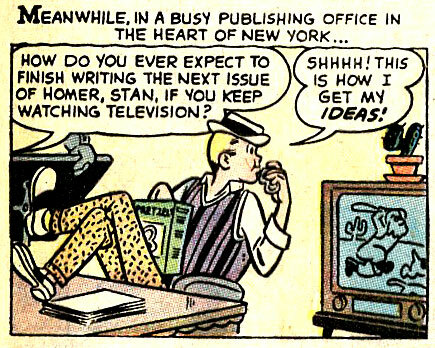 He and DeCarlo appear as themselves in one of the highlights of Issue #1 in the four 1970s Homer reprint issues. It’s a funny, self-deprecating short gag story — meta before we even used the term — in which the Homer and pals, unhappy with their portrayals in comic books, head to Manhattan to complain to the comic’s creators. Unfortunately, DeCarlo was ill served by the 1970s reprints. Issue #1-4 of the reprint series republishes covers and stories from the 1955 series, but DeCarlo’s credits are erased from the reprinted stories — an especially egregious, intentional change in the story that stars him, for example. It’s an odd decision, especially at a time when Marvel had made a point of crediting its artists almost from the first while DC was still frequently leaving the creators’ identities up to guesswork in the letter columns. 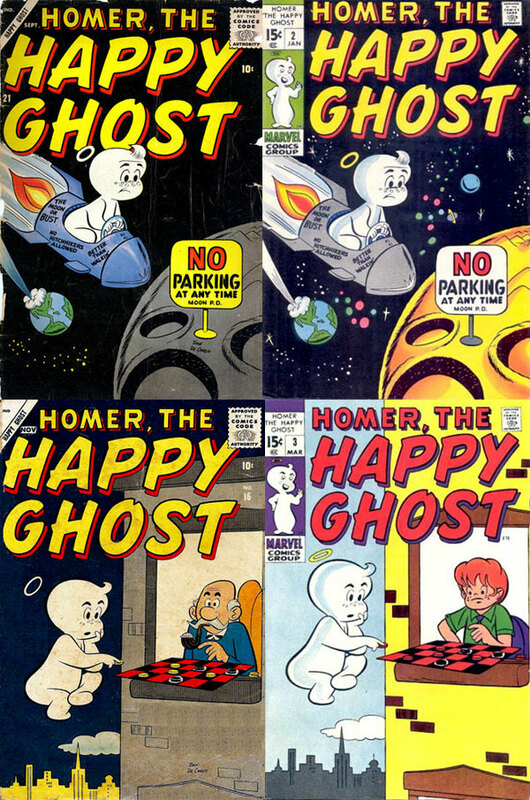 Panels printed in original Homer, The Happy Ghost #18 (March 1958) were reprinted in Homer, The Happy Ghost #1 (November 1959), removing reference to Dan DeCarlo’s name. The reprints even removed DeCarlo’s signature from and altered the art of the new covers. Sadly, this isn’t even the worst time comics have done wrong to DeCarlo: A lawsuit over the creation of Josie and the Pussycats resulted in DeCarlo’s loss of any credit on the characters and Archie then severed their relationship with him. Ah, comics, we love you, but there’s so much deceit and trickery in your history. Left: Original 1950s Homer covers. Right: 1970 reprints altering art and removing Dan DeCarlo’s signature. 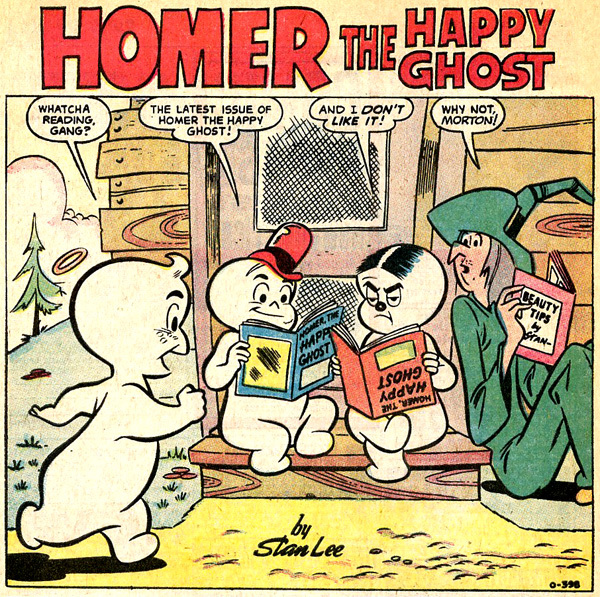 The revival of Homer, The Happy Ghost ended with its fourth issue, cover-dated May 1970. Marvel’s other ‘70s reprint titles featuring kid-oriented humor from the 1950s were gone by 1974, replaced with titles like Marvel Two-in-One, Ghost Rider, and The Defenders, characters and stories more friendly to the Marvel superhero fan. Today, not many fans, or even Fans, remember the short return of Homer the Happy Ghost. If there’s anything we’ve seen from Marvel history, however, it’s that no character remains in limbo forever. When even the kid-friendly characters of Marvel’s 1980s line Star Comics pop up again in an X-Men book, there’s hope for everybody. One of these days, I bet we’ll see Homer fighting alongside S.H.I.E.L.D. or the Guardians of the Galaxy in one of Marvel’s mega-crossover events. And if we don’t…well, our comics world is the poorer for it. Leave a comment below! Even if you’re a ghost! This is great! I remember some of those.